The park, which covers an area of 2,168 square kilometers in the Phanom Dong Rak mountain range, stretches over 4 provinces including Nakhon Ratchasima, Nakhon Nayok, Saraburi, and Prachin Buri. Khao Yai became Thailands first national park on 18th September 1962 and is also originally recognized as the National Park Heritage of Asian Group Countries. Popular activities in the park include butterfly and bird watching, animal watching and trekking. The Park has numerous butterflies and birds as surveys indicate that over 293 species of birds use Khao Yai as a feeding ground while Khao Yai is the habitat of over 200 species. In addition, the park is home to an abundance of wildlife. The most frequently spotted animal is the deer that grazes on grass plains and sometimes come to be fed around the park office. Other animals spotted include elephants, sun bears, wild boars, monkeys, tigers, gaurs, and mountain goats. To facilitate animal watching the park built 2 wildlife watchtowers at Mo Singto and Nong Phak Chi. Visitors are allowed up there between 8 a.m. and 6 p.m. Within the Park is the Phimai Sanctuary, one of the grandest and most important Khmer historical sites in Thailand. The word Phimai appears in an inscription on a stone slab at the front doorway of the building as well as in many other structures. It is believed that the word Phimai referred to a religious figure or site. The Phimai Sanctuary is rectangular in shape and is 565 meters wide and 1,030 meters long. It consists of ornately carved sandstone and laterite structures. The most special characteristic of the sanctuary is that it is the only one that faces south while the others usually face east. This is probably because it was built to face the route that the Khmers traveled from the capital of the empire, to the south of Phimai. 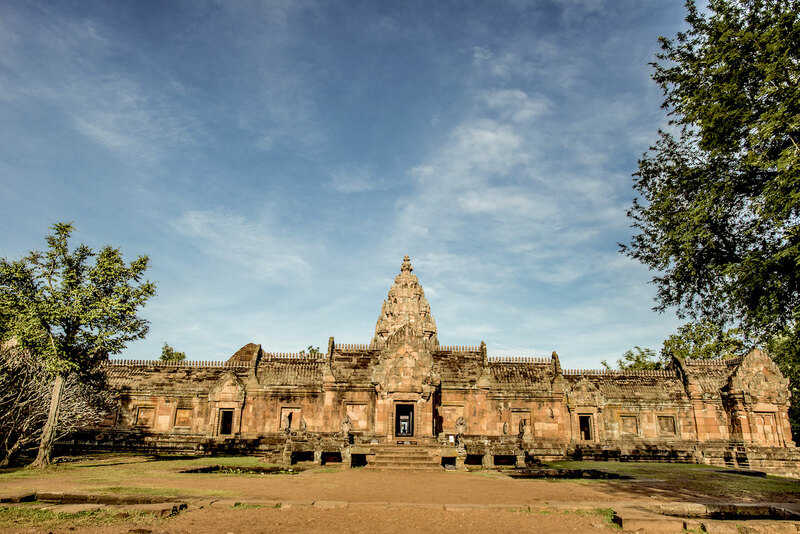 From stone inscriptions and the architectural style, the Phimai Sanctuary was most likely built at the end of the 11th century during the reign of King Suriyaworaman I. The architectural style is that of the Baphuon style that prospered at the time. However, some characteristics are similar to that of Angkor Wat, which became popular at a later period. Some additions were made to the site in the early 18th Buddhist century during the reign of King Chaiworaman VII when Phimai had close relations with the Khmer Empire. The sanctuary was always a religious site of the Mahayana sect of Buddhism because King Suriyaworaman I and King Chaiworaman VII were followers of the sect. The Naga Bridge is the first part you pass when visiting the site. The bridge and lion figures stand in front of the Gopura (porch) south of the main pagoda. The intention may have been to build a link between earth and heaven according to both Hindu and Buddhist beliefs concerning the universe. The Gopura was adapted as the wall around the sanctuary and the four entering porches. There is a large corridor connecting the outer and inner areas of the main sanctuary. Above each porch is a lintel of various designs. The Main Prang or pagoda is on an open area in a curved walkway. It is the centre of the site and is made entirely of white sandstone and is different from the porches and walls that are made primarily of red sandstone. This is because white sandstone is more durable than red sandstone. The pagoda is 28 meters high, has a square base, a portico and stairways and doors in all 4 directions. The pagoda consists of a base, outer walls, columns, and porches with beautiful designs. Of vital importance are the lintels that mostly recount the tale of Ramayana from Hinduism and tales of the Mahayana sect of Buddhism. The lintels above the 4 doorways of the main pagodas inner chamber, the most important room of the pagoda, are all about Buddhism reflecting the Buddhist influence that eventually surpassed that of Hinduism. The carvings are of the Baphoun style and the Angkor Wat style leading to the belief that the main pagoda was built at the end of the 12th century. There are other pagodas, which are Prang Brahmadat in front of the main pagoda, Prang Hin Daeng and Ho Phram (Brahma Hall) to the right. This park covers an area of 140 square kilometers, where plateaus and hills dominate the parks landscape. There are sheer cliffs, which resulted from earthquakes. Most trees are of the deciduous dipterocarp forest. Irregular shaped sandstone is found scattered throughout the area. Beautiful flowering plants grow among the rocky ground. Travelling can be made from Khong Chiam District along Highway No. 2134, followed by Highway No. 2112, and then turning right for another 5 kilometers. Pha Taem and Pha Kham are located near the national park headquarters. On the cliffs surface are numerous prehistoric cave paintings dating back 3,000-4,000 years ago that offer insight into the way of life that existed during the pre-historic days and reflect the ancient lifestyle of the people who once lived in the area. These painting depict scenes of fishing, rice farming, figures of people, animals, hands and geometric designs. It should be noted that the most extensive site for cave paintings in the country is that of Pha Taem. Home to one of the world's oldest agrarian communities, Ubon Ratchathani is also the 'cradle of northeastern civilisation'. Recently discovered archaeological evidence suggests that humans settled in the region between 14,000 to 6,000 years ago.